Affordable Dentures & Implants - McDonough, P.C. 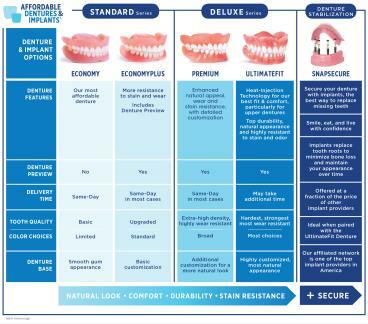 McDonough, GA Affordable Dentures & Implants offers several styles of full dentures, each with special features and advantages. It’s part of our mission to put transformation within reach. See below for more details, or call us at 770-818-6783 if you have a question about a particular style. If you're looking for a dentist in McDonough, GA, you've come to the right place. Affordable Dentures is an established dental practice with a modern approach to oral care. Our goal is to provide quality care to every patient who walks through our doors, and we achieve this objective through attentiveness, open communication, and patient education. We invite and encourage you to learn more about our unique approach to dentistry. To speak to a member of our office staff or to set up an appointment, call Affordable Dentures today. Dr. Simmons earned her Doctor of Dental Surgery degree at Meharry Medical College in Nashville, TN. She also completed a General Practice Residency at King Drew Hospital in Los Angeles, CA following dental school. Based on many years of valuable dental experience, Dr. Simmons and her staff are proud to offer professional, compassionate care to patients that visit her practice.